Is parking available at your office? Yes. There is plenty of easy, convenient parking available in front of our offices. When can I eat after my filling? We use composite resin for restorations or ‘white fillings’. Generally, they will not need additional time to harden so they are safe to eat on right away. However, if you had an injection, we recommend not eating anything until the numbness wears off. How long will it take for the injection to wear off? This will depend on your individual circumstance, but most people find that the numbing injection wears off in 1 to 4 hours. How do I achieve my Hollywood smile? Who wouldn’t want a Hollywood smile? 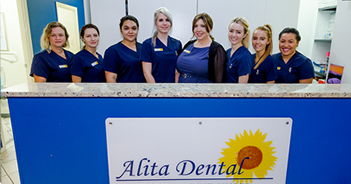 At Alita Dental we offer many options ranging from orthodontics, whitening, veneers and much more to help give your smile that Hollywood sparkle! Please do not hesitate to contact our clinic to book in a consultation with one of our friendly dentists to discuss treatment options and prices. Please keep in mind that your oral health will need to be in a healthy and stable condition to be eligible for these treatment options. If you have any questions or concerns please feel free to contact our clinic or have a chat with your dentist at your next appointment. Does our clinic offer payment plans? Our clinic certainly does offer payment plan options for all types of treatment. We have an organised system that allows a payment to be applied to your account weekly. If you are concerned that you need extensive or expensive treatment then we are more than happy to have one of our dentists construct a treatment plan for you. From there, we are able to find a suitable amount that is repaid weekly. If you have any questions or concerns regarding payment plans, please do not hesitate to contact our clinic or have a chat with our friendly team at your next appointment. How soon can you fix my toothache? We like to set aside emergency spots every morning. Call us first thing to get one of these slots. if you don’t call us first thing or all those slots are gone, you can come down and wait and we will see you before we go home. Do you use overseas laboratories for crowns, bridges or other items? Never. We believe in obtaining quality work from local technicians. We like that they can come by to take a shade. In the unlikely event of a problem, they can fix it immediately at no charge. We also like to ‘Buy Australian’. How much do you charge for a filling? It is impossible to quote one price for fillings since, like snowflakes, everyone’s teeth are different. The cost of a filling can depend on which tooth needs to be filled, how many surfaces are on the affected tooth, if the tooth needs cusp capping or pins, whether the tooth actually needs a filling or if it needs a root canal treatment or if we have to correct a gum problem. We will be happy to supply you with a cost estimate after we have performed our examination. Alita Dental offers you two choices in whitening: in-chair or at-home. Whitening performed at our clinic takes around 90 minutes and whitens your teeth quite dramatically. Your dental professional places a protective material on your gums and soft tissues and paints your teeth with a specially prepared gel that has a high concentration of peroxide. Once everything is in place, a high intensity light is used to activate the gel and several passes with the light are made to ensure a whiter, brighter smile. The process for whitening at home is very simple. Your dental professional will take an impression of your teeth and use this to manufacture specially designed whitening trays. Once the whitening trays are ready and you have been supplied the whitening gel, you can begin to whiten your teeth at home by wearing your trays and gel for a few hours each evening over a few weeks.